Buster the Bus recently visited Carleton School to help with teaching bus safety. SYRACUSE — Carleton School recently recognized Bus Safety Week. Buster the Bus made his annual trip to Carleton School to help the students learn about bus safety. Bus Safety Week occurs every October to bring awareness of the dangers school buses face on the road and for motorists to look for buses on the road. Students boarded a bus and talked about why it is important to stay in your seat and follow the bus driver’s instructions. Outside the bus, students learned about the Place of Safety when getting on and off the bus. Students are to stay at their Place of Safety so they don’t become injured by the bus or other traffic. Buster showed students the spots around a bus where it is difficult for the driver to see them. The students enjoyed meeting Buster and learning about bus safety. They encourage everyone on the road to look out for school buses and keep our children safe. Information provided by Carleton School. 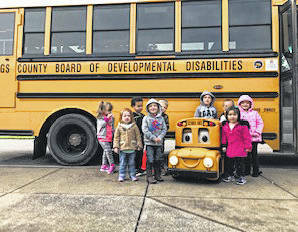 https://www.mydailysentinel.com/wp-content/uploads/sites/14/2018/11/web1_11.9-bus-safety-group_ne2018118152730790.jpgBuster the Bus recently visited Carleton School to help with teaching bus safety.